This whole getting body back after baby thing is pretty slow going. I’m one of those girls that expects results over night, and when I don’t get them, I get frustrated. It sure would be nice to be able to bounce back like Gisele has ten weeks after having a baby. I mean, c’mon…what is that all about?! As my husband would remind me in my moments of crying frustration, “Chels, you don’t have a personal trainer, a personal chef, and a nanny to watch your kid 24/7.” That’s very true. I don’t. What I do have, though, is a supportive husband who motivates, pushes, and yes, even guilts me into going to the gym (on the days I don’t want too). Josh also has been very supportive in my quest to start initiating even more low-calorie meals into our weekly menus than we had before. I’ve begun having at least one or two meatless meals a week, and finding lower-calorie dinners that imitate some of our higher-calorie favorites. So far, every dinner has been a hit – so much so, that some of the dinners may be replacing the less-healthy versions. 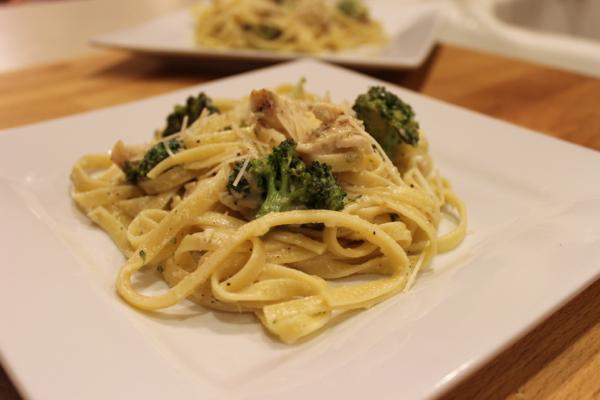 I wouldn’t have believed this chicken and broccoli fettuccini alfredo was a low-calorie dinner if I hadn’t made it myself. There is absolutely zero butter in the sauce! Yes, you heard me…NO BUTTER! 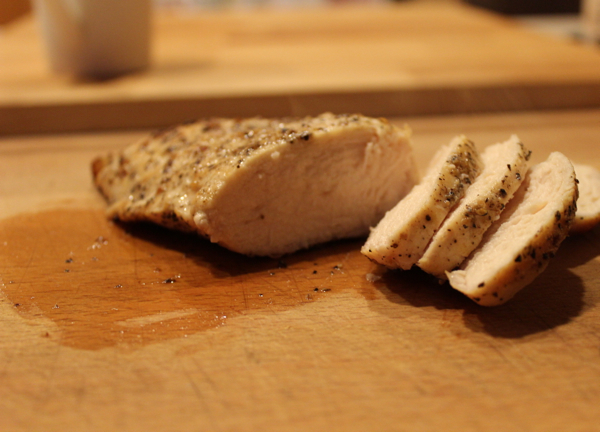 Instead, you are rewarded with delicious grilled chicken (not fried or seared), and roasted broccoli, which maintains its color and nutrients, and an even better flavor. With dinners like this, I don’t feel like I’m missing out on anything. I feel good about what I’m putting into my body and more importantly, my family’s body – and guess what? You can feel good about it, too. You don’t even have to be a celebrity with a personal chef to have a yummy and healthy dinner like this. You can just make it yourself! 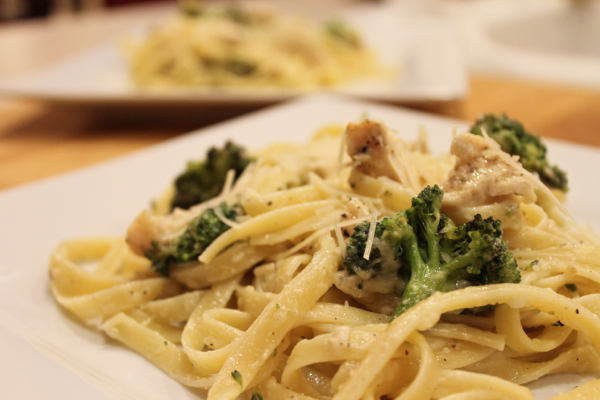 Are you craving the indulgence of Fettuccine Alfredo without the guilt? Then try this lighter version that will make your figure happy. Pre-heat oven to 425 degrees. Start a large pot of water and cook pasta according to package directions. 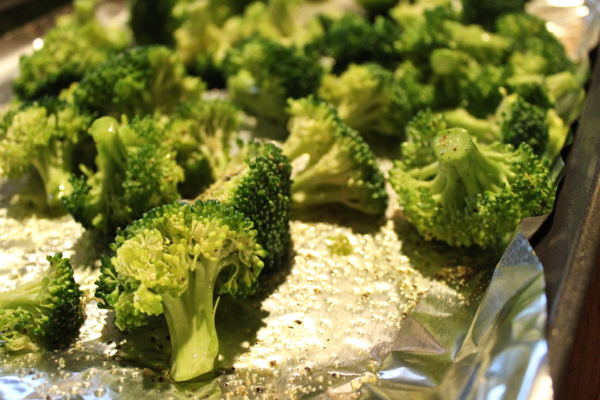 While water begins to boil, line a cookie sheet with aluminum foil and lay broccoli florets so that they aren’t over-lapping each other. Toss with extra-virgin olive oil and salt and pepper to taste. Roast for 20-25 minutes. Set aside. While the broccoli is roasting, grill the chicken till the juices run clear. To make the sauce, heat extra-virgin olive oil in a saucepan over medium-low heat. Add garlic, stirring frequently until golden brown, about 2 minutes. Whisk in flour until smooth. Gradually, whisk in broth, milk, yogurt, pepper, and nutmeg. Bring to a low boil, stirring consistently. Lower the heat and simmer for 3-5 minutes, or until sauce has thickened, stirring carefully. Stir in cheese until melted. 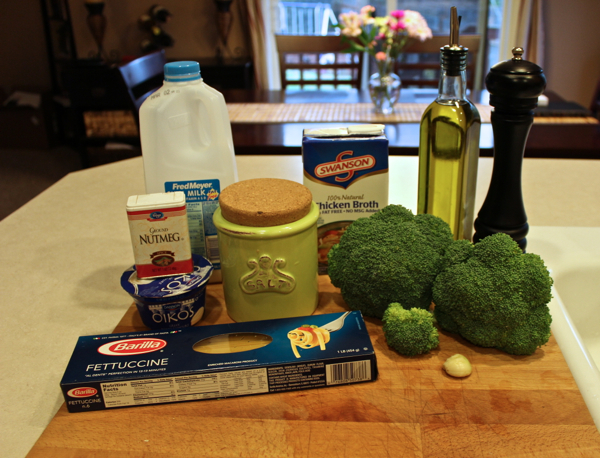 Toss broccoli, chicken, pasta, and sauce to combine and evenly coat. Note: A serving of this pasta dish roughly comes out to around 580 calories. You can lower the calories even more by using whole wheat pasta and more veggies. This makes such a nice meal. It has foods, I like and it is balanced. Thanks.